I posted this on the Matterport Facebook Page earlier this morning. I have a feeling that if several hundred of us sent and e mail to say the Wall Street Journal about what is happening a story would be written and we may see a shift that would give us clear ownership of the copyright so we do not have to give Matterport the control of our work product. I for one will not be signing this Terms of Service change in fact I believe Matterport could have planned this from the very beginning and that good faith was absent in the sale of the "CAMERA". It appears you are trying to grab the same if not superior rights to my scans, scans to which I hold the copyright. This to me seems to be an unconscionable demand and is far outside of terms at the time I purchased the camera. The benefit for this is solely to you. Even if I could sell the copyright to the "scan" in the future, I would feel at least a moral obligation to point out, to the buyer, I was so foolish as to give you the rights to the scan without compensation. What this does is turns my camera into a multi thousand dollar brick and that is of course not pleasing. I think there is important NATIONAL if not INTERNATIONAL News story, to see the way a camera manufacturer, has in what they think is a skillful manner, jumped in and claimed the work product of the photographer and or Realtor that they marketed the camera to. I expect to be addressing this in more depth in the very near future. Your forced terms seem like a return to the trap of what was called the "company store system" and frankly I think lots of people will agree with me. Were I sitting on a jury listening to this case where people were demanding the cost of the camera back and damages, you are a MEGA loser! But that is really not important the real story will be what happen to you in the Media and my ability to sell the scans. I expect that as you do not control all the forums, relative to this product soon a single large media source will hear from a several hundred MSP asking for some attention to this story. 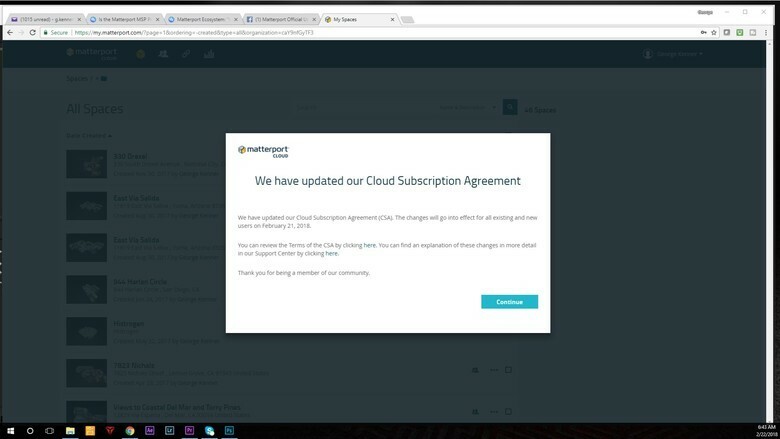 When I clicked "Continue" was that considered signing / agreeing to the change? That was not my intent. "Continue" to me means read more. In my opinion the MEDIA is the place to turn, not to a lawsuit...This is a rights and future privacy issue. They have already in my opinion betrayed us for the data grab, who wants to put their clients data in their hands...? Not happy! Super-sneaky, if that's the case. @GeorgeK The WGAN Forum is media that is read by the trade press that is read by the consumer press. The groundswell begins here: in the public, We Get Around Network Forum. Then, trades will pick up the story. Then, national media. Continue - does not mean accept in my opinion. I agree with George K that I feel I would be locked out of already paid for services. Dan there are faster ways into the media... and that could be happening right now. Perhaps you could create a video that tells the story and we all could share that in our media outreach? Perhaps you could edit the recording? A highlights real with your commentary and polished video editing/productions values added to help grab the media's attention? Also reach out to the big camera / tech influencers on YOUTUBE. Once this gets out it will not stop. But remember sometiems companies ride the wave on this bad publicity and use that to their advantage to gain free exposure even if its bad. I must admit I am starting to think Matterprt are out to scam people who have spent thousands on a camera . I have potentially very large clients ( 400 + scan per month ) , but after this c*ap, I will go back and restructure the service offering with a plan b. We were even looking into buying more cameras for the workload. There are several 3D tour solutions that I think are hot on the trail of Matterport (iguide, etc.) - maybe still behind by a bit in quality, but the gap is quickly closing. My guess is this is going to push a lot of us toward those other options. I've been on the fence for about a year with continuing as an MSP and have seriously considered using a different provider. This might be the final straw. Metroplex360 that comment really made me laugh. And that is a good thing as I am very angry at this point in time with Matterport! As stated, tours will not be publicly reusable by anyone. The idea is to grant license to use the tours privately for use with 3rd party offerings such as RoOomie. Therefore, a new agency will not be able to buy the tour from Matterport. @Metroplex360 thank you for clarifying this. @Metroplex360 - can you believe anything they say? They've already shown they'll change the terms at the drop of a hat. So what they state today isn't necessarily what they'll do tomorrow. @Metroplex360 @eggardner So let me get this right. It will be private to use on 3rd party applications and these 3rd party applications will not allow you to embed or send your newly created 3rd party content out ??? How will the 3rd party content guys make money if nobody can view their work? @Gerhard - I assume the end customer would subscribe to/buy the service! The end customer may not want to share it to the world and only have it for their own private viewing to make decisions. To me the issue isn't about them using Rooomie or any other service, but the fact that the terms have been changed and they're so one-side with zero thought being given to the MSP or their businesses - and we're being told to like it or lump it! The other thing is that MP will be selling this service with no recompense to the MSP who without their efforts and sweat that sale wouldn't be possible. Also, this thing about allegedly contacting MSP's clients is totally out of order if this is happening! Yes, I was confused with that too, @VTLV! I saw his message in Facebook regarding moving his details from the group and yet he started the thread a few days ago! I’ve seen a bunch of people picking teams on that FB page. I’m glad WGA is here to have a bit of a controlled environment for topics and data. If anything gets off subject, Dan usually suggests a new topic is created here. That page feels like anarchy with one topic being used and tornadoes into 20 off key rants. The committed townspeople start picking away at the loudest voice summoning the defenders of the brand who then come in to play cop telling us the brand does not intend to use the new power how we envision. And just like that, the several hundred people uprising mentioned above get tired and slowly give up. @VTLV Hey, I loved taking on those guys. They are a bunch of millennials getting offended by the truth they cant swallow or cant see even if they were born 70 years ago... I love the facts and the truth. I feel bad for the poor newbies, I get that this must come as a shock to them. Just starting your business and then a month later Matterport hands you some KY and starts winking at you. Then you know somethings up (no pun intended). But we all survived a one week / month stand with Mattreport in the past. Let us hope we can carry on with business and that they get their house in order. They have a lot to fix, like the basics customer service, trained staff in lying. Open and clear policies and direction of the company. They must stop copying Apple and be Mattreport. It just made me laugh how they are so scared for this to get out in the media. Its easy Mattreport swoops in fixes their mess and looks like a hero, and gets free exposure. But I guess you guys are still spending your marketing money on Google Ad words.